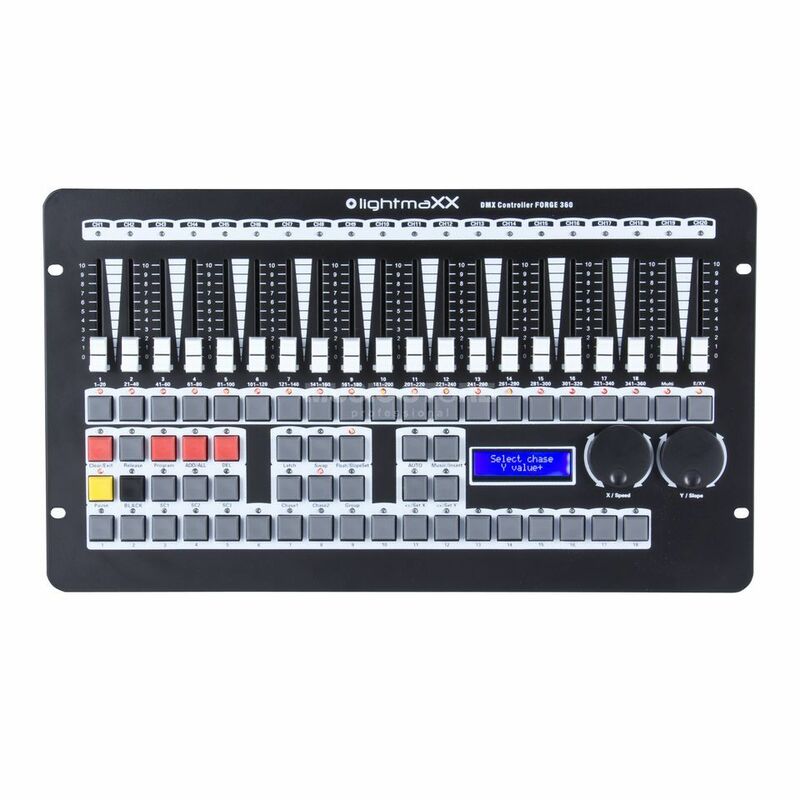 lightmaXX DMX Controller FORGE 360 540 Scenes,36 Chaser,18 Fix. DMX Controller FORGE 360 540 Scenes,36 Chaser,18 Fix. CONTROL 18 UNITS, EACH WITH UP TO 20 CHANNELS. 54 SEPARATE SCENES RUN SIMULTANEOUSLY. 36 PROGRAMS(NO SHARED SCENES) RUN SIMULTANEOUSLY AND BE CONTROLLED SEPARATELY, WITH ADJUSTABLE TIME AND SLOPE FOR EACH STEP. 18 PROGRAM GROUPS RUN SIMULTANEOUSLY. EACH GROUP CONSISTS UP TO 36 STEPS,AND EACH STEP IS WITH 36 PROGRAMS, FADE TIME AND SPEED ADJUSTABLE. UP TO 200 STEPS IN EACH CHASE; TOTALLY 1200 STEPS CAN BE STORED. PAN/TILT FUNCTION WHEELS, FOR CHANNEL ASSIGNMENT.